Doggieland has officially launched a new website! Along with a new look, we now have online shopping! You can now purchase your dog’s favorite healthy food, treats, and supplements at www.doggieland.ca/shop. 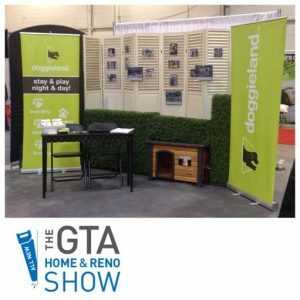 Last month Doggieland had a booth at The GTA Home & Reno Show. People were happy to visit us with our four-legged friend, Indy, and learn about Daycare & Boarding options available while renovating at home. As the weather warms up, which it promises to, and you start working on your home projects, consider daycare. The stress from loud noises, new smells, and being underfoot can be stressful to your dog. Think of Doggieland as your dogs vacation from your home renovation! It is the time of year when snow turns into mud and winter coats need to be cleaned up. All of our Doggieland locations offer quality Grooming. As it is going to get busy soon, we recommend calling ahead to book your pooch’s spring make-over session. Pups can’t handle pottying in all the snow out there. Next time, lay down a tarp over an area near your door. When the snow has stopped, remove the tarp, and your pet has a snow-free area to do her business. Great tip from Lawrence Park Animal Hospital. In spring, when dogs connect in off-leash parks, daycares or boarding facilities they may come in contact with the virus called Kennel Cough. If your dog has shown any symptoms such as: continued coughing, sneezing or a runny nose, refrain from exposing them to other dogs until a week after their symptoms cease. The Bordetella vaccine can help reduce symptoms of the virus just like the flu shot for humans. Have you seen our Doggieland Vans out and about? They can often be found providing daily pick-up & drop-off services in the GTA as well as transfers to and from our Vaughan Boarding location. Remember to follow us on Doggieland photos posted daily! For more information, contact us today at the Doggieland location nearest to you.